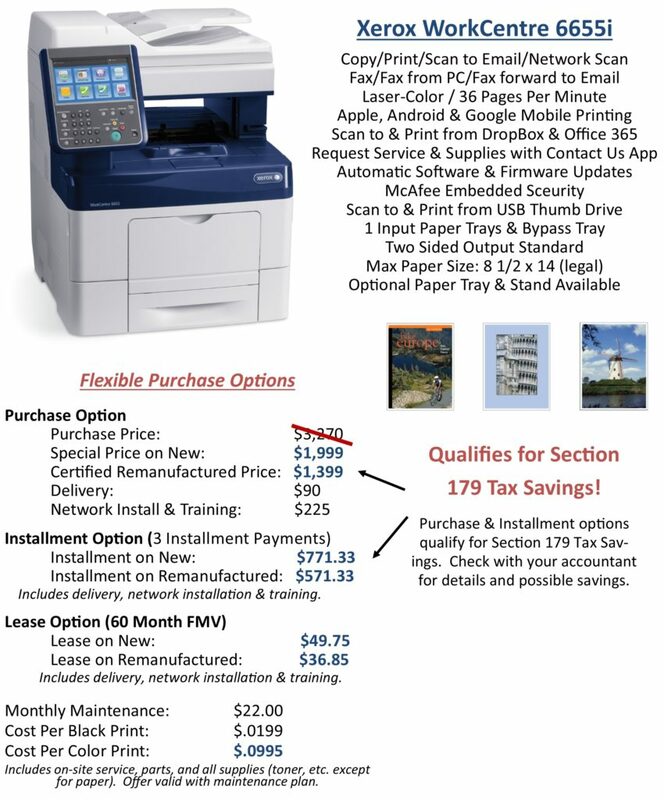 By utilizing our Year End Savings and Section 179 Tax Incentives you can gain a powerful multifunction printer without a major impact on your bottom line, and increase the security on your network! The Xerox WorkCentre 6655 comes with copy, print, fax and a variety of scanning features including scan to email and workflow scanning. The 6655 comes with the same feature rich controller as our larger models. Users can scan to a variety of cloud applications including Dropbox and SharePoint and print from their mobile phones. With the Firmware Connect App for the 6655, when security patches are released for newly discovered security threats, updates are then automatic. This provides the most up to date protection for a customer’s network! Additional options include 2nd paper tray and stand. Act now! Offer ends 12/27/16.